Back in 2006, an article at the Economist reported “The Indonesian economy is growing. But so, unfortunately, is poverty“. How about our poverty reduction programs’ progress in 2011? On 7 December 2011 at PPIA (Indonesian student association) academic workshop, Chandra Wibowo, a graduate of Master in Applied Economics (Public Policy) who was the former president of PPIA University of Adelaide in the 2010-2011 period, presented his work “A Rethinking of Indonesia’s Poverty Reduction Strategies”. The workshop was well-attended by Indonesian students and researchers currently residing in Adelaide, South Australia. Indonesia is blessed with rich natural resources. Unfortunately, more than 32 million Indonesians currently live below the poverty line and approximately half of the households remain clustered around the national poverty line set at IDR 200,262 per month ($22) (World Bank, 2011). This condition seems to contradict with most of Indonesia’s macroeconomics indicators. The national economy is expected to grow by 6.4 percent in 2011 and will increase by 6.7 percent in 2012. The country’s gross national income per capita has increased from $2,200 in 2000 to $3,720 in 2009. Moreover, Indonesia has managed to meet many of its fiscal targets, including a significant drop in Debt-to-GDP ratio from 61 percent in 2003 to 27.5 percent in 2009. The budget deficit is projected to be as little as 0.4 percent of GDP in 2011. The statistics may suggest that economic growth is an important condition for poverty reduction but it is not a sufficient condition. One thing that the workshop participants agreed on was that poverty is multi-dimensional. Defining poverty is not straightforward; let alone reducing poverty. Nobel laureate, Amartya Sen, offers a comprehensive perspective to define the poverty which has shifted the paradigm of development away from solely economic growth-centred. The human poverty and development indices published in the annual UNDP Human Development Report reflect Sen’s approach. Amartya Sen reveals that the dimensions of poverty are not only income-consumption poverty but also deficiency of capabilities linked to health, education, and participation in the society activities. Policy makers are required to understand the root causes of poverty to be able to design effective poverty reduction strategies. Chandra Wibowo reviewed that according to Lever (2005) there are at least three main aspects that can explain poverty: (i) the individual causes including lack of skills, effort and savings; (ii) external factors such as limited access to education facilities, poor government support; and (iii) ‘fatalism paradigm’ or simply bad luck. Lever argues that in developing countries, the most disadvantaged groups attribute the causes of poverty to factors beyond their control (fatalistic) and blame the government for their unlucky life. A prominent economist Jeffrey Sachs believes that poor countries are stuck in “poverty traps” , that they are poor because they are poor; they are too poor to save and fail to accumulate sufficient capital that could pull them out of poverty highlighting the role of foreign aid. Sindzingre (2005) argues that state institutions and norms may be the key determinant of multidimensionality of poverty, as institutions affect individual mental model. She argues that low quality of institutions have significant causal effects on decreases in countries’ income level. Low national income makes a government unable to provide proper basic services to its people and causes a poverty trap. In addition, Grigorian and Martinez (2005) find the link between institutional qualities and economic growth. 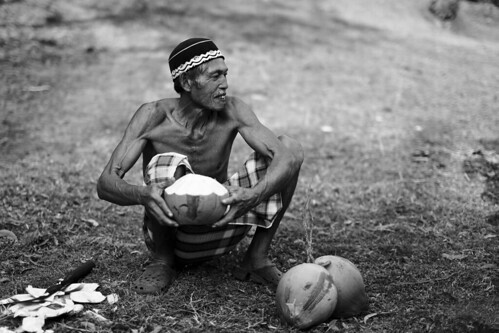 What has the Indonesian government done to address poverty issues? Indonesia adopts a four-track strategy: pro growth, pro job, pro poor, and pro environment. Such a strategy is aimed to encourage growth with equity, that is to reduce income gap. Yet, in many cases each of these strategies can be somewhat conflicting. President Yudhoyono administration has considered poverty reduction to be a priority in its medium term and annual plans. The 2004-2009 Medium-Term Development Plan (RPJM) provides a broad strategic direction for the government over five years. It integrates the National Strategy for Poverty Reduction (SNPK) and addresses the growth-related aspects of poverty reduction. The government has set poverty reduction targets linked to the Millennium Development Goals. The Indonesian government has done a top-down policy approach. It covers all areas, from fulfilling basic needs, society empowerment, and micro-financing. More specifically, the government’s strategies are formulated through 3 cluster programs based on objectives and targets of each program. The first cluster consists of family-based social assistance program which are aimed to fulfill basic necessities. Various programs in this cluster include Raskin (food for poor people), Jamkesmas (Society Health Insurance), Beasiswa Miskin (Tuition Fee Assistance for Poor Children), PKH (Program Keluarga Harapan) (Conditional Cash Transfer). The second Cluster focuses on society empowerment with the objective of providing social funds for poor communities that they can use to improve basic social and economic services based on their own priorities, i.e: PNPM Mandiri which aims to increase the capacity of poor communities. The third Cluster focuses on micro-enteprises empowerment by providing micro-financing for small scale businesses without any collaterals, i.e: Kredit Usaha Rakyat (KUR)Program. Indonesia has also received substantial assistance from various foreign donors such as the Australian government through AusAID, the US government through the USAID, the World Bank, and many others. During the recent visit to Indonesia by President Barack Obama, the United States Millennium Challenge Corporation, or MCC, announced a grant for $600 million to support Indonesia’s efforts to reduce poverty through economic growth (voanews.com). The grant will fund three projects designed to expand the use of renewable energy and improve natural resource management, reduce low birth weight and childhood stunting, and modernize public procurements to lower costs and root out waste, fraud, and abuse. The key question is are these all approaches effective? Recent developments in economics field suggest that governments in developing countries must think ‘out of the box’. Innovative approaches to identify and target the poor should be based on well-designed research. Professor Esther Duflo of MIT is a leading economist in this area. She, through her various projects in many developing countries especially in the African and Asian regions, has promoted the use of the so-called social experiments or randomised controlled trials which were initially popular in science and medicine. The trials basically split groups of people into two groups, the control (those who receive no treatment) and the treatment group. The randomness nature of dividing these groups should ensure that any differences between the outcomes of the groups are because of the ‘treatment’ (ie policies, interventions, etc) effects controlling for some other important factors. Using social experiments, the government will know what kind of policies that work and does not work, and also the reasons. Dufflo states that the failure of achieving the poverty reduction goal may be not due to the lack of pro-poor policies but because of the poor people themselves. She calls this problem as the “last mile problem”. Whilst it provides one of the strongest methods to provide evidence about how to reduce poverty, the use of social experiments to formulate a good poverty reduction program is not free from criticism. As summarised by an article in the Economist, researchers performing experiments are sometimes accused of being ‘atheoretical’: they crank out their trials and let the results speak for themselves. The trials might show whether a policy works, but not how it works. The results might show whether the average people benefit; not whether any individual patient will benefit. The trials might also limit the scope of the interventions to those at the micro level. Hence, interventions that improve the functioning of higher-level institutions are difficult to be investigated with such trials. But of course, the debate whether the success of macro-level policy or micro-level interventions should come first is like a chicken and egg question. However, in a country where the poor needs ‘a big push’ to help them out of poverty, the role of the government through its macro-level policy remains critical. Moreover, whilst a good evidence-based policy design, for example by using social experiments as the methodology, is crucial for making a good policy, it is also important to improve bureaucratic quality and institution to eradicate corruption. As we know, this is the problem that Indonesia is still struggling with. This article is prepared by Chandra Wibowo and Risti Permani. Chandra works for the Ministry of Finance of the Republic of Indonesia and has recently completed his postgraduate study in School of Economics at The University of Adelaide. Risti Permani is a postdoctoral fellow at School of Economics, the University of Adelaide.